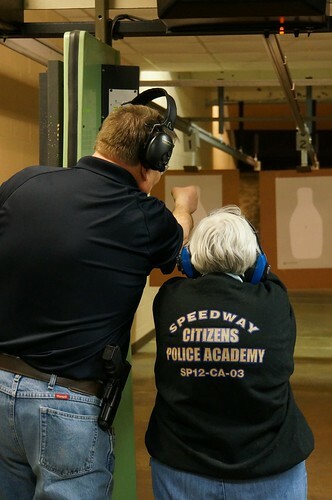 On Wednesday, February 26, 2014, Speedway Police Citizens Academy students were out of the classroom as they visited the Speedway Police Department for a tour, a polygraph demo, and to use the firing range for their Firearms II practical class. 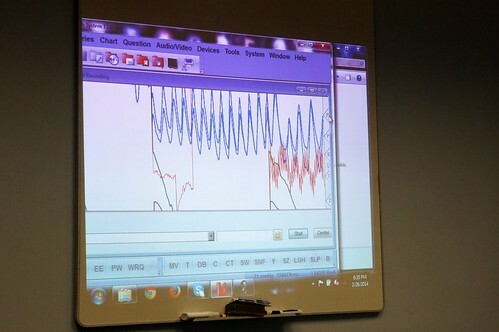 Lt. Trent Theobald of the Investigations Division gave students a demonstration on the Police Department’s computerized polygraph equipment. He explained that polygraph testing is typically done on potential new hires at the department as well as criminal investigations. Also on display for students was some older equipment. For the Firearms II practical class portion of the evening, students were brought to the police department’s firing range. 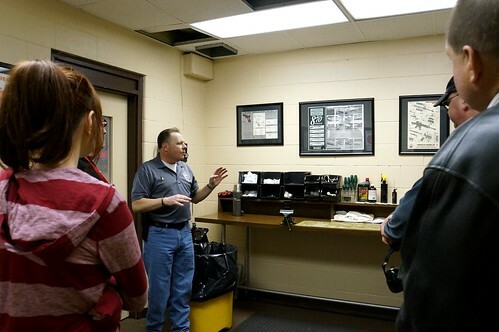 Below, Officer Chuck Ezell talks to students about SPD’s firing range, storage / gun cleaning area. 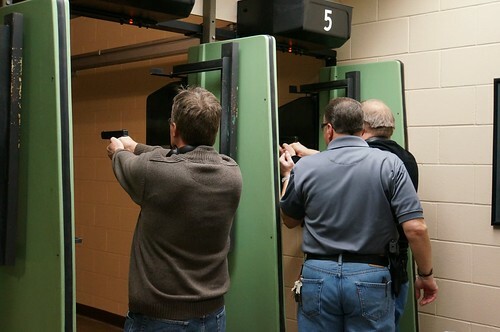 The firing range can simulate various lighting conditions, including complete darkness, using flashlights, porchlight, even with flashing red/blue lights from the officers’ patrol car. Officer Ezell assists students at the firing range. Sgt. 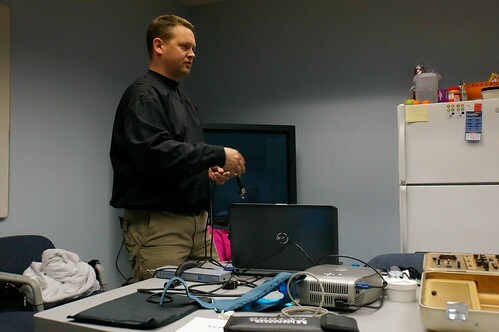 Rod Ferguson explains to a citizens academy student about the range, and the Glock pistol used by SPD officers. Slideshow of all photos from tonight’s class. Next week, Citizens Academy students will be back in the classroom to learn about SPD’s SWAT unit, as well K9, with a demo from K9 Officer Tom and his partner, Officer Mat Turpin. For updates, be sure to subscribe to our blog using the form at right, or follow us on Twitter, Facebook, or Google+!